What I try to do with reviews at this Bookshelf blog is keep it simple and spoiler-free, and let you know whether I'd recommend you pick up a copy of what I just read. Seems to work okay. This time, a brief review of Mister Miracle # 1-5 (DC, 1989). I love the little box on the front cover of this comic. It reads "DC Comics Aren't Just For Kids!" The perception, among many funnybook readers at the time, was that other publishers were releasing more mature fare than DC, who insisted on turning out pablum for little kids. Ah, the late eighties. I guess that you kind of had to be there, and maybe kind of had to be a defensive adolescent. 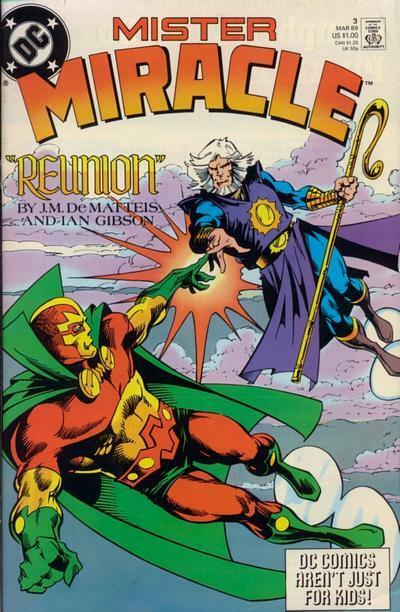 Anyway, I believe that this was the second resurrection of Mister Miracle, a really fun character with an awesome costume who was created by Jack Kirby in the early seventies. This time out, the comic was written by J. M. DeMatteis, who was using the character in the lighthearted Justice League International, and drawn by Ian Gibson, one of my favorite comic artists. The premise is that Mr. Miracle, a superhero - slash - celebrity stage magician and escape artist, and his wife Barda are trying to live a normal life in a quiet New England town, but the alien menaces of their home worlds of New Genesis and Apokalips keep interfering with the peace and tranquility they were looking for. It's done with the same whimsical, never-very-heavy touch as JLI, and a similar lack of imagination. The first five issues tell one story arc, and the first three parts each end with the exact same cliffhanger. "Golly! The sudden surprise appearance of another character from Jack Kirby's original run of comics that introduced all these characters!" I've got a lot of time for Kirby's "Fourth World" creations, and think that many of the follow-ups crafted by other writers and artists have been pretty good, if not essential. These, I really only tracked down for Gibson's artwork, and I didn't have trouble finding them for less than cover price. I like his layouts and the fun expressions and body language of his characters a lot, and he can certainly draw beautiful women, but I don't think anybody sent Gibson the memo that Barda should look at least a little bit like Lainie Kazan. When you go as far off-model as Gibson does here, you can't really celebrate the results. The comic is inoffensive and bland, basically. It doesn't suffer quite as badly as JLI did with its forced humor and funny-because-we-insist-that-it-is tone. In fact, DeMatteis attempts a little character drama between Mr. Miracle and his estranged father that's almost touching, but Oberon's one-note grouchiness is boring, and the safe, predictable plot is not challenging. Worth a glance for Gibson's fans, but otherwise not recommended.